← Are Asian Americans the New Jews? 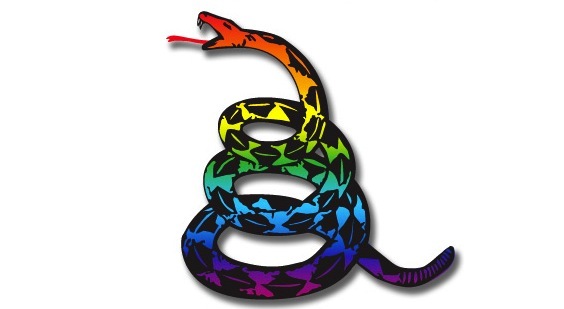 One of my readers had the great idea of turning the Rainbow Rattler design into a decal for her car. A fantastic way to fly the conservative lesbian and gay colors! So to that end, I’d like to make the rattler graphic more widely available to anyone who would like to use it for T-shirts, decals, or whatever other creative whim comes to mind. Below are two Rainbow Rattler designs, one on a black snake-skin background and the other on a white background. There are many online outfits that will create T-shirts and decals very inexpensively. The decals are definitely pretty cheap. And the more you order, the lower the individual price. 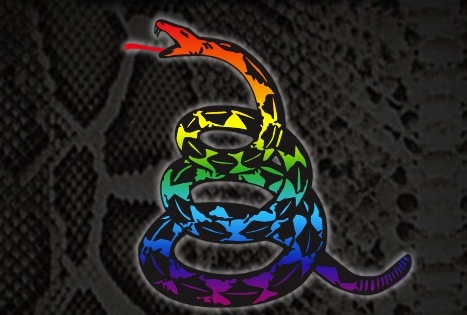 This entry was posted in Lesbian/Gay, Political Activism and tagged gay, graphic, lesbian, rainbow rattler, Tea Party. Bookmark the permalink. I took out the white and dark backgrounds of the rattler and left it transparent, if you’d like to have one of those. We should make this our conservative pride summer. I feel more proud coming out as conservative than I ever did being a lesbian (for a 100 years). So, any of you getting these suckers made? I’m getting some t-shirts made. will others have access to them, like via web sales? Or? I don’t have plans to sell them. I’m checking out a couple of vendors and can let you know their prices, etc. There are lots of vendors who can do the t-shirts or decals, even flags.